I am not a pork lover. In fact, seldom eat it. However, I really loved this particular pork meat dish! It is so “motherly” taste, I shall say. Just close your eyes, flash back your childhood moment where your mum’s home-cooking scent emerges in the air that you can even smell it at the door step upon reaching home from school. Yes, that it is. From my mum. Loved the fragrance and taste of this dish which I’ve learnt from my mum (smile). The ingredients and condiments used in this dish were simple, in fact. It’s the cooking technique. I fried the potatoes beforehand, to crisp it a little. The texture of the pork meat was also a little crisped instead of soft and tender kind. Crispness makes the bites more interesting, indeed. 1) Heat wok with 3 tablespoon of oil over high fire. Add sliced potatoes, and shallow-fry it till slightly browned. Drain on kitchen towel, and reserve for later. 3) Add black bean paste and pork meat, stir-fry for 1 minutes. Add oyster sauce, and sprinkle sugar. Reduce heat to very low fire. Stir-fry the pork meat gradually till liquid in the wok slightly dries up. 4) Return potatoes to the wok. Combined it well. Add dark soy sauce. Continue to stir-fry till liquid totally dries up. Heat off. Serve. The main key in yielding crisped meat is to simmer it with very low heat. 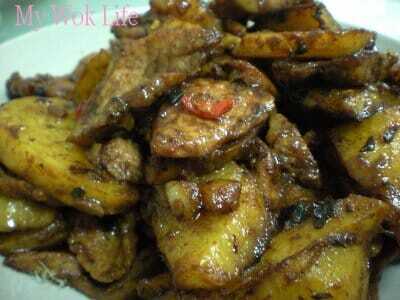 It is to extract the liquid from the meat to make it crisped, and yet, without burning the meat. Not to worry, the meat will never too hard to bite, but crisp that make the bites more interesting. The potatoes were soft with deep/ shallow frying method. This is not a gravy-ed dish, but due to the “slow and low (heat)” frying method, taste of the meat and potatoes was so intense and flavoursome. Calories in a decent portion of this dish counts about 400kcal. Yes, it’s not a light dish huh! Tips: Reduce the amount of chili, if you prefer less spicy, and vice-verse. What brand of black bean paste you used? You use the same brand of black bean paste for all you dish that require black bean paste? Not necessarily all same brand. I don’t use just a particular brand, but many decent ones from supermarkets. I have tried Lee Kum Kee brand which commonly found in supermarkets. Chicken Stock Cube with No MSG?